Dacquel (R) and Escaner (L). Both "The Abra Kumander" Rene Dacquel (20-8-1, 6 KO's) and tough Giovanni Escaner (18-3, 11 KO's) of Sultan Kudarat made identical weight of 118 pounds for their exciting main event of the Marty Elorde Promotions card scheduled for tomorrow Saturday (Dec 22) at the popular Elorde Sports Complex in Parañaque, Metro Manila. 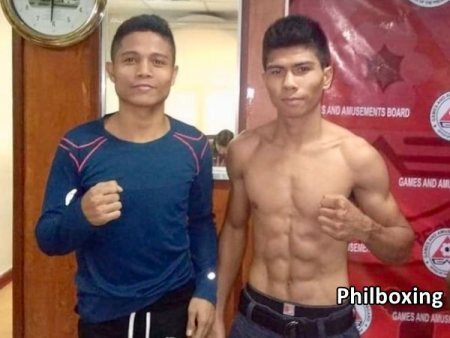 In the co-feature, Robin Langres (9-2, 4 KO's) of Palo, Leyte, and southpaw Jason "Manefisto" Buenaobra (6-3-3, 3 KO's) of Sorsogon both tipped the scales at 119 lbs., for their in a non-title 10-rounder bantamweight clash that promises fireworks. 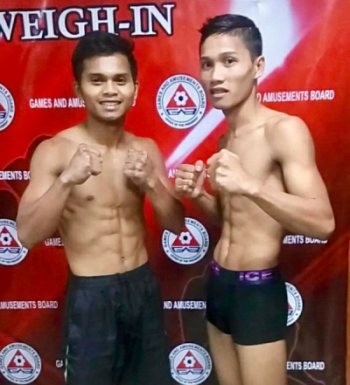 Also, rookie Ranelio Quizo (2-0, 0 KO's) of Las Piñas scaled-in at 113 pounds, while warrior Rolando Plaza (1-4-1, 0 KO's) of Cagayan de Oro made 111 lbs. for their 4 rounder in the flyweight division. More fights complete the thrilling evening of boxing. 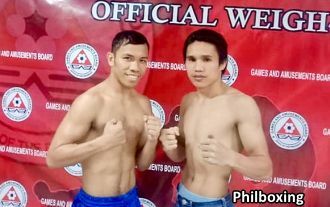 This boxing show Saturday evening at the Elorde Sports Complex in Sucat, Parañaque is a successful matching-up effort of prolific matchmaker Saldy Lopez. The card is produced by man of boxing Marty Elorde in association with his popular brother promoter Gabriel "Bebot" Elorde.